I made it back from my retreat. And it was pretty awesome! I walked nature trails, I read, I sewed a lot, ate delicious food, slept in bunk beds for the first time in years (and got a top bunk- what what!). I just feel so refreshed and energized! I didn't realize how much I needed to just unplug for a few days, get away from work and home and recharge my batteries. So how did I fair on all those projects I took along? Take a peek. This is my second go at SeeKateSew's apron pattern. 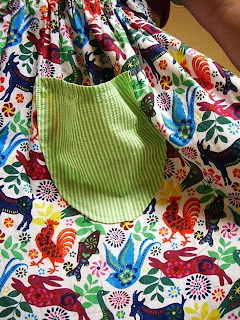 I used some newer fabric in my stash and it's bright and colorful. I only bought a yard of it, and now I'm kind of wishing I would have bought more. I goofed up my ruffle on the neckline, so I just left it off. I think it's just as cute without the ruffle. Close up of the fabric. It's pretty cute! I made all four of the Michelle Pattern's (affiliate link) grocery bags that I had cut out. Here are the finished projects. This bag is a cute navy blue fabric I got at Joann's. The lining is a pale beige that kind of has a birch pattern to it. It's been in my stash forever and I finally got up the guts to cut into it. Do you ever do that? 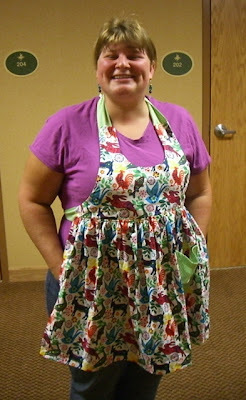 Hold off on cutting into fabric you really like? Here's a closer view of the fabric. Here are the other three bags. 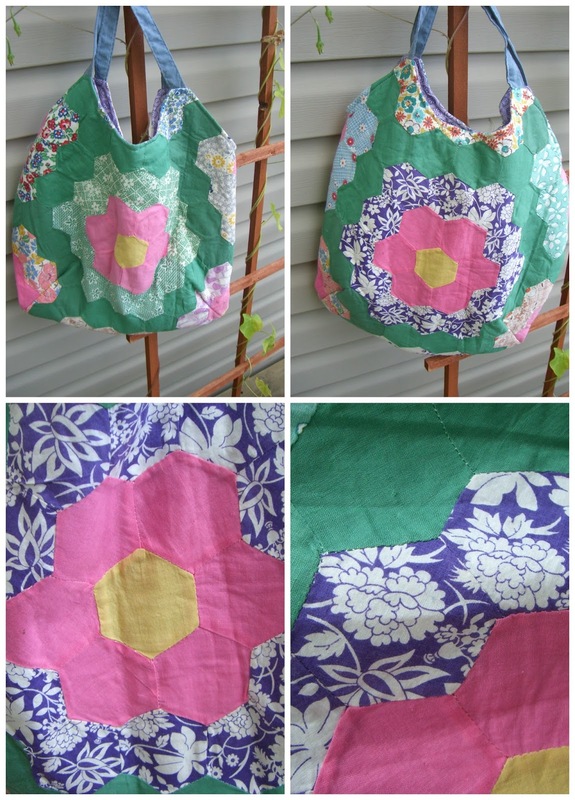 The third and fourth picture are of the same bag, it's just reversible. 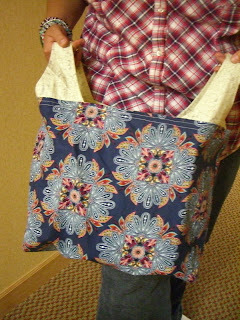 This is a bag made from iThinkSew's Alice bag pattern. I had found this quilt top at the thrift store for a couple bucks. I loved it, but wasn't sure what I would do with it. 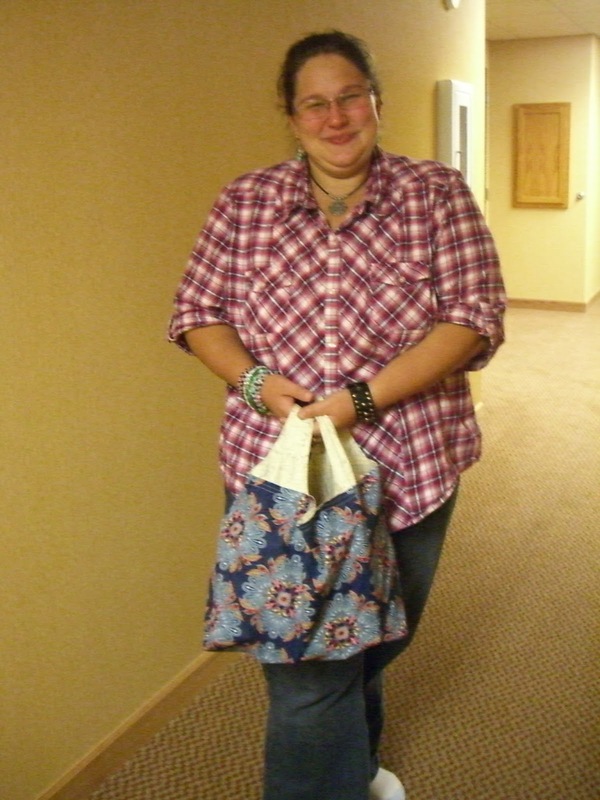 I had made an Alice bag a few months before that and loved the simple but unique design, decided the quilt top would be perfect and proceeded to cut it out, as well as the lining, interface the exterior with some fusible fleece, and then stick it aside for at least a year. I threw it in with my projects to take on the retreat at the last minute and I was so glad I did. It literally took me less than an hour to finish it and I love how it turned out. You can see the quilt fabric is fragile and I don't think this bag will last forever, but I'd rather use it until it wears out than leave quilt top stuffed in a bag somewhere never used. I was pretty happy with all I got done, and I'll talk more about the retreat later in the week, just had to show off my finished for now.